****Always enter your monogram letters in normal sequence: First, Middle, Last. We will arrange them in the correct sequence for the style monogram you have chosen. The same oversized-design as our Nomad, but with an array of added features. We've added a super-durable Ballistic Cloth bottom to the already tough CorduraTM nylon construction. A flap with locking buckle conceals an assortment of pockets, organizers and key holder for all your accessories that you want easy access to. 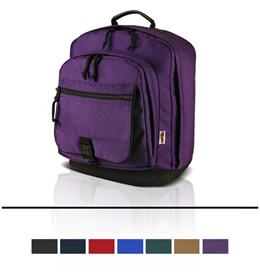 A zippered pocket on the outer side of the flap provides another convenient storage space. Copyright Parrott Canvas Company. All Rights Reserved.